As a Hytech Forming Systems customer, you’ll have access to our technology whenever you need it. We can handle all of your manufacturing needs in our facility, but if you choose to move your manufacturing in-house, you can opt to have Hytech Forming Systems technology right under your own roof. The AccuForm® IMD IL Series is a cost-effective option that offers unmatched flexibility, repeatability and reliability. Imperial: 41.5" x 36" x 94"
Imperial: 50.6" x 45" x 114"
The AccuForm® IMD LD Series offers the same benefits as the IL Series, with additional value-added features. This is our top-of-the-line model, with semi-automatic operation and the largest format size available. Imperial: 110" x 68" x 75"
The PF60 ProForm® combines the proven hydro form embossing process with heated tooling in an efficient, cost-effective package. Imperial: 110" x 80" x 79"
Which AccuForm® or ProForm® Machine is Best for Me? Hytech Forming Systems has served a wide range of industries. In fact, since 1980, we’ve made parts for all types of applications. 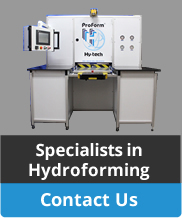 We can help you determine which of our machines will help you manufacture your parts efficiently and cost-effectively. Give us a call (602-944-1526) to discuss the timing and selection of the right equipment for your projects. ©2019 Hy-Tech Forming Systems USA, Inc.